" In great state the Chelabi was brought to my tent, a splendid handsome Kurd he is, the six feet of him robed in white and cloaked in a gold embroidered abbayah." 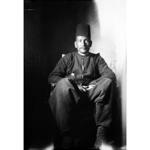 Photograph M_245 (1909) - Gertrude Bell Archive, click the marker to view the photo. "Now the Chelabi is the great magnate of the district. All the people, from Jezireh to Mardin, all the Tur Abdin, belong to him; they are his tribe and he rules them with far more authority than the government possesses." Photograph D_201 (1905) - Gertrude Bell Archive, click the marker to view the photo. "I looked up and saw a man crouching in my tent, a shadowy figure outlined against the sky." Letters 28/5/1909 - Gertrude Bell Archive, click the marker to read the letter. Background based on M_215 & M_218, Church of El Adra (The Virgin).
" 5th century if not 4th, domed, with exquisite carved mouldings - in short perfect, and all standing." 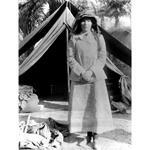 AlbumM (1909) - Gertrude Bell Archive, click the marker to view the album. Album K (1909) - Gertrude Bell Archive, click the marker to view the album.